You will find below the horoscope of Melissa Rauch with her interactive chart, an excerpt of her astrological portrait and her planetary dominants. If you know the time of birth of Melissa Rauch, we would appreciate it if you would send us your information with your source, at stars@astrotheme.com. To thank you for contributing to the enhancement of our astrological database, we shall be glad to send you the astrological portrait (34 pages) of this celebrity. Horoscopes having the same aspect Mars square Neptune (orb 0°08'): Britney Spears, Cristiano Ronaldo, Kylie Jenner, Demi Moore, Zac Efron, Alexander the Great, Andy Warhol, Barbra Streisand, Gary Oldman, Henry VIII of England, Dakota Johnson, Patti Smith... Find all the celebrities having this aspect. Horoscopes having the same aspect Mars conjunction Saturn (orb 0°12'): Rihanna, Helena Blavatsky, Victoria Beckham, Ellen DeGeneres, Cindy Crawford, Anti-Christ, Maria Callas, Pablo Escobar, David Lynch, Gia Carangi, Dolly Parton, Steven Tyler... Find all the celebrities having this aspect. Celebrities clicked on in real-time: 576,188,442 times. Melissa Ivy Rauch (born June 23, 1980) is an American actress and comedian. She is best known for her role as Bernadette Rostenkowski on the CBS sitcom The Big Bang Theory. Early life and education Rauch was born in Marlboro, New Jersey. She has a Bachelor in Fine Arts in Acting from Marymount Manhattan College. Career While studying, Melissa performed as a stand-up comedian around Manhattan, and soon made a name for herself on the New York City comedy scene with critically acclaimed appearances like her one-woman show called "The Miss Education of Jenna Bush," in which she portrayed the former President's daughter which played to sold out audiences. Here are some character traits from Melissa Rauch's birth chart. This description is far from being comprehensive but it can shed light on his/her personality, which is still interesting for professional astrologers or astrology lovers. 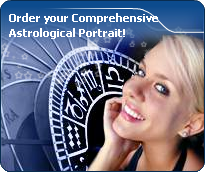 In a matter of minutes, you can get at your email address your astrological portrait (approximately 32 pages), a much more comprehensive report than this portrait of Melissa Rauch. Warning: when the birth time is unknown, which is the case for Melissa Rauch, a few paragraphs become irrelevant; distributions in hemispheres and quadrants are meaningless, so are dominant houses and houses' accentuations. Therefore, some chapters are removed from this part. The predominance of Water signs indicates high sensitivity and elevation through feelings, Melissa Rauch. Your heart and your emotions are your driving forces, and you can't do anything on Earth if you don't feel a strong affective charge (as a matter of fact, the word "feeling" is essential in your psychology). You need to love in order to understand, and to feel in order to take action, to the detriment of a certain vulnerability against which you should learn to fight. Like the majority of Earth signs, Melissa Rauch, you are efficient, concrete and not too emotional. What matters to you is what you see: you judge the tree by its fruits. Your ideas keep changing, words disappear, but actions and their consequences are visible and remain. Express your sensitivity, even if it means revealing your vulnerability. Emotions, energy and communication must not be neglected; concrete action is meaningless if it is not justified by your heart, your intellect or your enthusiasm. The Mutable mode is the most emphasized one in your natal chart, Melissa Rauch, which indicates a mobile character that is curious and thirsty for new experiences and evolution. You are lively and flexible, and you like to react quickly to solicitations, but don't confuse mobility with agitation, since this is the danger with this configuration - and with you, stagnation is out of the question. Security doesn't matter as long as you are not bored. You optimize, you change things, you change yourself... all this in a speedy way. After this paragraph about dominant planets, of Melissa Rauch, here are the character traits that you must read more carefully than the previous texts since they are very specific: the texts about dominant planets only give background information about the personality and remain quite general: they emphasize or, on the contrary, mitigate different particularities or facets of a personality. A human being is a complex whole and only bodies of texts can attempt to successfully figure out all the finer points. Your intelligence is sensitive and delicate, with good comprehension abilities, Melissa Rauch, which endows you with a strong intuition and receptivity. To you, impressions and feelings prevail over facts and your excellent selective memory is not cluttered with useless elements. Although you are not aware, your fertile imagination may lead you to change your daily reality so that it matches your dreams better. If you are creative, you may make use of your imagination in literary pursuits where you can freely invent beautiful stories taking place in the past. Your passion for History is such that you may immerse yourself into it with too much nostalgia and therefore, you may miss opportunities the present offers to design projects and to think of the future. What is it, that really appeals to you, Melissa Rauch, to love or to please? You have so much charm and so much volubility that you easily manage to be what is known as a femme fatale. Feelings and intellect are so tightly mingled that you may not know any more whether you are really in love or whether you are acting. You have a taste for flirt and variety, and you appreciate very much complicated situations where no one knows where the truth lies any more. You shift from one game to another. To you, everything can be an agent for seduction, be it your attitudes, your words or the way you dress. You do not separate your actions from your desire to please. People who do not understand this are in trouble because, if they take your sweet and well-phrased speeches too literally, they are likely to undergo cruel disappointments: for you, it is only a matter of living in the moment and you never commit yourself because, above all, you loathe confinement, even just its thought. Melissa Rauch, you skilfully make use of your energy and you are like the arrow that reaches its target with great precision: with piercing eye and sharp mind, you take action meticulously and efficiently. Like the surgeon with his scalpel, you know exactly what you want and you belong to the category of specialists, not the generalists. Critical, pernickety, extremely organized, you want to foresee and to analyze. You prefer to master your business too well rather than not enough, even if you must put a huge, sustained, long lasting effort into it. Sexually, you remain fanatical about cleanliness. You may be prone to fantasies such as fetishism. Your love life is fine if you avoid the unforeseen events that you loathe. This text is only an excerpt from of Melissa Rauch's portrait. We hope that it will arouse your curiosity, and that it will prompt you to deepen your knowledge of astrology, as well as to visit and use the wide range of free applications at www.astrotheme.com. Your Life Path is influenced by the Master Number 11, Melissa, which indicates a strong, demanding, and uncompromising destiny. It is all about revelation and early calling. You feel that you are entrusted with a mission, with the certainty that no setback could endanger it, and your own certitudes prevail over any other motivation. You have a lot of strength, and sometime, intransigence. Short-lived fashions and life vagaries cannot weaken your beliefs. You pursue a set direction, in quest of an extraordinary destiny, with the help of your intelligence, your inspiration and the natural influence you have over people. Even though your entourage may not always understand your secret determination and perceive you mainly as an impatient person, your fortitude overcomes many a doubt and obstacle. You can sacrifice everything for the sake of your deep aspirations.